In the summer of 1977, my parents sent me to Ireland to spend time with my grandmother, my great-aunt, and my great-uncle. I was excited, scared, and a little mad—I would be missing the opening of Star Wars. (I knew even before the movie came out that it was going to be huge.) But I was sixteen years old and it was legal to drink alcohol in Ireland—Luke Skywalker would have to wait. I left Boston at 7 o’clock in the evening and woke in a new land. I was now more scared than excited and I didn’t care if I ever went to the movies again; I just wanted to go home. When I saw my grandmother at the baggage claim, my nerves were suddenly calmed. I was exhausted as I climbed into the VW Beetle my grandmother had come to collect me in with her neighbor, one of the few men in her village who had a car. As we left Shannon Airport and headed to Renvyle, a small village in Ireland’s western region of Connemara, I intermittently dozed and stared out the backseat window as I listened to my grandmother and her friend chat. They seemed to speak in quick, short bursts of unintelligible words, followed by sudden deep breaths and a long sigh, and then the cycle would continue. Were they speaking English, or was this an alien language? (I would later find myself taking deep breaths mid-sentence and saying words such as ‘tis’ and ‘grand’.) The cadence of their comfortable conversation became a hypnotic drug that sent me into a dream state, and the winding roads acted as a child’s swing rocking me to sleep. I was helpless. I am not sure to this day at what point between Shannon and Renvyle I was suddenly released from my brogue-induced stupor, but I do know the antidote that raised me to consciousness. It was the sweet, unfamiliar smell of turf burning. I asked my grandmother what ‘that smell’ was, but she just laughed and said she didn’t smell anything. I was insistent that something strange yet aromatic was burning; it was smoky and ethereal, alerting me to take note. I soon came to cherish the smell of a turf fire and then, in an instant, I didn’t seem to notice it any longer. Had I become accustomed so quickly to the smell that only days before I had found strange? Was this the spell it had on me? Had the Connemara countryside enveloped me, alongside generations of my family, and cloaked me in the centuries-old warmth that defines its people? 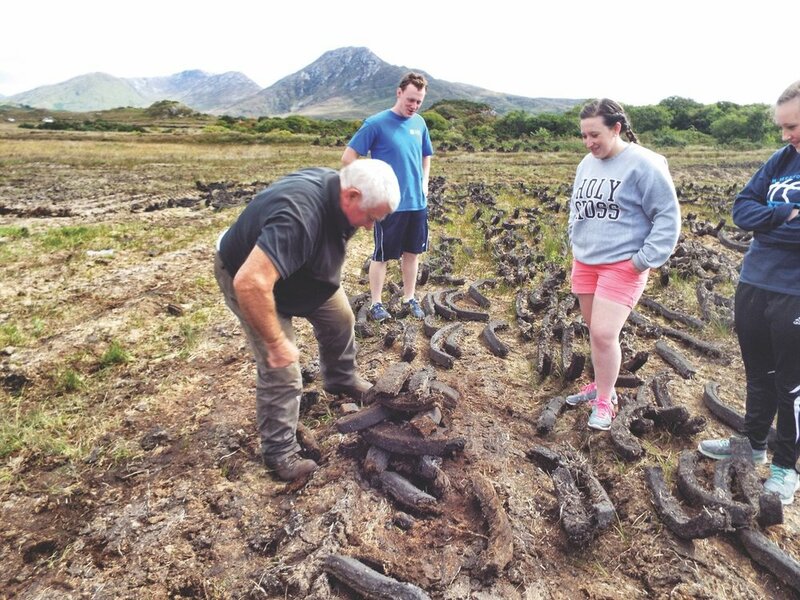 On a recent stay in Ireland, I asked a dear friend and neighbor, Martin Joe Coyne, to take my children out into his bog for an up-close look at cutting and drying the turf and hauling it home. This process takes many months, so we got the abridged version that afternoon; since it was August, the turf was nearly dry and ready to bring home and store for the winter’s fuel. For kids from New Hampshire who are accustomed to adjusting the thermostat when they are cold or adding wood (delivered to our house already cut, split, and seasoned) to the woodstove, this was an eye-opener. As Martin Joe had been born and raised in the area, he provided the authentic experience—he has been cutting turf since he was a young boy. With a quiet, humble tone, he demonstrated the process that has continued for hundreds of years. He made sure to emphasize to the kids that if done for many hours each day, this back-breaking work would ‘make a man out of ye’. 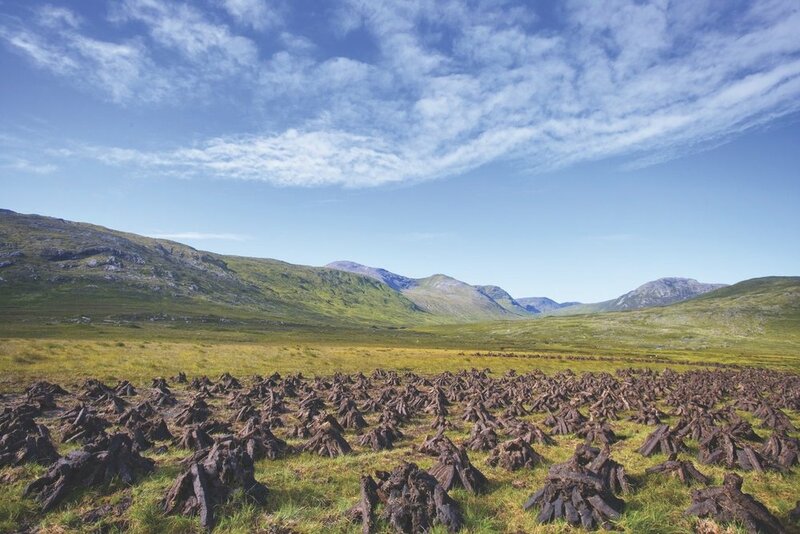 Walking the bog with ease, Martin Joe had my children stack the turf into a ‘proper footing’ to ensure optimal drying, but he emphasized that the stacks are always at the mercy of the weather—there is not much that can be done about the rain! He explained that for most of the summer the turf is turned, stacked, and readied for hauling home and storing for the upcoming winter. Turf (or peat) is partially decomposed organic matter formed in areas of poor drainage and wet, mild climates. Peat is 90 to 95 per cent water, but when cut into blocks and dried, it becomes a fuel source that burns easily with a distinct smoky aroma. Traditionally, turf is not cut until after St. Patrick’s Day. Early May is generally the turf-cutting time in Connemara, but depending on the length of winter, it could be earlier. It typically takes a week of cutting to lay down enough turf for the coming year. Turf cutting is done with a sleán, a long-handled turf spade with a shaped steel end. Similar tools dating back thousands of years have been found preserved in the bogs. Turf was the primary fuel source for heating and cooking in Ireland as far back as the seventeenth century. Today, many homes in the west of Ireland continue to use turf as a secondary source of heat and often for nostalgia. If you get a chance to visit the west coast of Ireland, be sure to take time for a cup of tea in front of a turf fire. I’ll not promise you’ll fix the world’s problems, but I dare say you will have a sense that you’ve come home. That wonderful summer of 1977 was nearly forty years ago, and I have been back to my family’s home many times since, the almost four-hour drive from the airport has been pared down to a little over two hours, thanks to improved roads and highways. The bigger towns have changed over the decades, but as you leave the cities and head out to the country, time has stood still. It is as if that magical smoke seen billowing out of every chimney along the way has enchanted the land. The old-world cottages and the rolling hills and the fierce sea have remained unchanged in my eyes, and my mother before me said the same. It is unusual for so much to stay untouched, but that is the beauty and the mystery of Connemara. O, to be sure, Connemara natives are modern folk, same as any one of us, but they have found a way to seamlessly adapt deep-rooted traditions with prevailing advances, thus never losing sight of who they are and where they came from. To watch life unfold, juxtaposed between the ancient and the modern, is a rare gift. Visit Connemara and experience for yourself the simple gift of life the way it was meant to be lived. Connemara National Park Visitor Centre, located near the village of Letterfrack, is open from March to October and has a wonderfully informative living museum dedicated to preserving the history of the turf bogs, with tools and preserved artifacts reclaimed from the bogs themselves. Visit connemaranationalpark.ie to learn more.